Pass the ball to Raya and help WASH initiatives for children win big. This profile is part of the 2016 Global Citizen March Madness Challenge. The challenge asks you to vote for your favorite global citizens, as we match them up “tournament style” from a “Sweet 16” starting round, all the way down to a champion on April 4th. She is 6 years old! 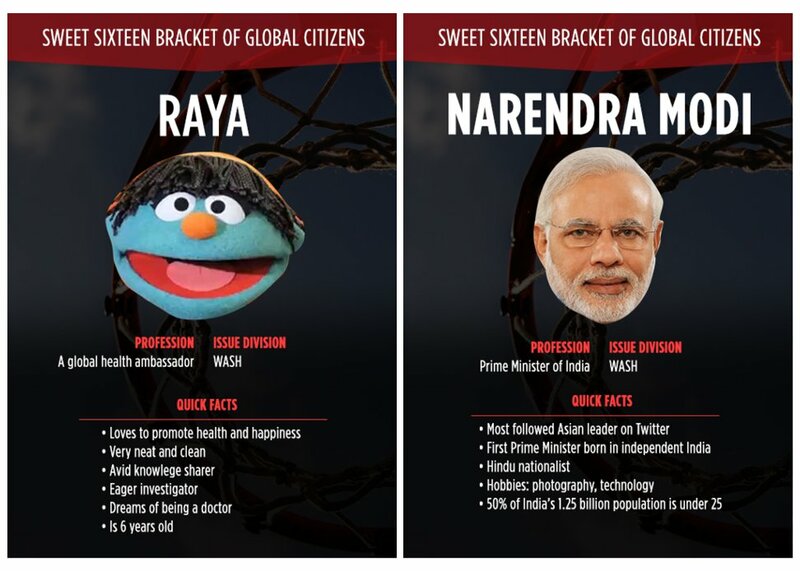 Raya is Sesame Street’s a 6 year old competitor of our Global Citizen’s WASH division in our Sweet Sixteen addition of March Madness. Raya is an outlier, not only because she is our youngest global citizen to compete, but also because she is a puppet, a humanoid rod puppet to be exact. Globally, waterborne illnesses are a leading cause of death for children under five, so Raya is committed to to teaching children everywhere about the importance of good health and hygiene. Raya knows that when children have access to clean water, improved sanitation and are taught good hygiene they will lead happy, healthy lives. Little Raya’s global reach in teaching young children about water and sanitation has been incredible. In the past year she has shared her knowledge on health and cleanliness to children throughout Bangladesh, India, Nigeria and Zambia. Raya wants YOU to know that children can become health agents of change in their communities by practicing and sharing these simple but life-changing behaviors like washing your hands, wearing sandals to the toilet, and drinking from a clean water source. You can help by supporting Global Citizen’s like Raya.